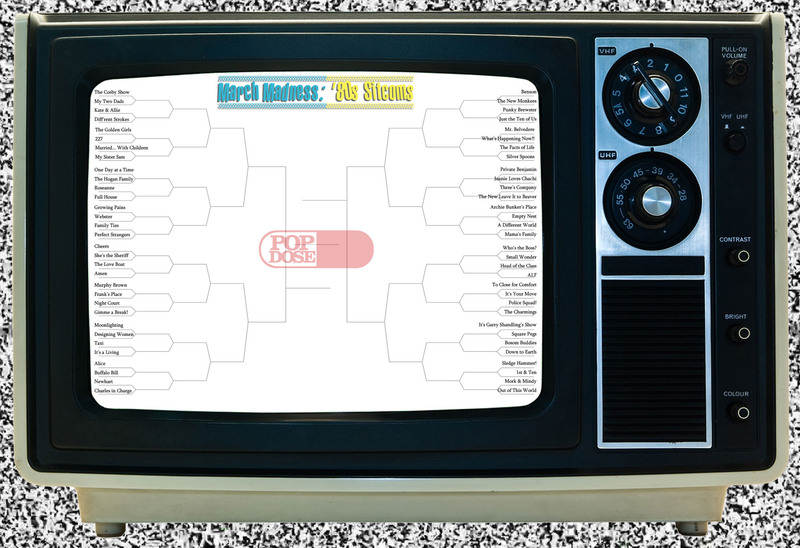 Popdose’s March Madness: ’80s Sitcom Edition tournament is coming! Here’s what you need to know. If there’s one thing we at Popdose love more than 1980s sitcoms, it’s March Madness. Actually that’s not true at all, but we do love ’80s sitcoms. Some of them at any rate. But since America seems to love tournaments in bracket form, we’re running one of our own this year. To make things even more fun and exciting we’re leaving it to you, our loyal readers, to determine which shows win and which get canceled! Over the course of two-and-a-half weeks starting March 18th, you’ll be asked to vote from a field of 64 comedies to determine which is the best (i.e. your favorite) of all-time. So that you can familiarize yourself with the rules and the general process behind this whole undertaking, here is what you need to know. be an American production. Sorry other countries, no offense intended. largely adhere to the traditional sitcom format. This means we did not consider variety shows (e.g. The Tracy Ullman Show) or sketch comedies (e.g. Not Necessarily the News) for inclusion, as funny as they may be. be at least partially comedic. So-called dramadies are allowed here. have debuted between January 1, 1980 and December 31, 1989 or aired a substantial portion of its original run in the ’80s. This is the clause that allows us to include shows that debuted in the ’70s but spilled over into the next decade. Otherwise it would have been a pretty desperate stretch to get 64 shows, believe us. A note on the regions — not all of the shows perfectly fit their bracket category. Don’t stress out too much over it. Voting will take place only on Popdose, and only in the posts for each round. Comments on the site or Facebook will not be counted as votes, although as always we welcome your feedback. The polls for each round will be open until 12pm Popdose Standard Time (Eastern Standard Time, give or take an hour), and no hanging chads will be counted. Attempts to rig the results may result in ALF being awarded the championship by default. With all that out of the way, be sure to mark your calendar and join us here on March 18th for the start of what we are sure will be a fun time for all!